Poker players after a way to improve their skills without heading into the casino where their opponents can see them can opt for live dealer variants online. One live dealer option available is Live Casino Hold’em, which offers the same gameplay structure as regular Texas Hold’em, except here it is player verse dealer. Featuring a human dealer, who you verse live, the title offers a significantly low house edge of just over 2% (better than single-zero European roulette). Additionally, the game is very easy to pick up for those who know the basics of traditional Texas Hold’em. We take a look at where you can find the live dealer poker variant with real money. Play live dealer Casino Hold’em at All Slots online casino. There are only two top providers we recommend which offer a Live Casino Hold’em option. Evolution Gaming is the predominant provider, featuring the live variant at many of the online casinos listed above. Microgaming is the other software provider, however with the 2016 move of adding Evolution Gaming’s live catalogue to their live casino it may not be available for much longer – you can still find the Microgaming variant at All Slots Casino however. Evolution Gaming can be found at the online casinos listed in the table, including Mucho Vegas and All Slots casino sites. You can follow the links to these websites and sign up to play Live Casino Hold’em – you can only play the game in real money mode so be sure your balance has been funded. Additionally, each site’s live casino has all its live croupier titles streamed to us via high quality video feeds directly on our computers, and players will always be able to sit at a live Casino Hold’em table – no waiting is required. While you may know what Casino Hold’em is, Live Casino Hold’em may be a whole new concept. 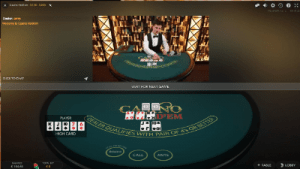 Software providers have taken the poker variant and set up real tables at a studio or a land-based casino to stream, in real time, directly to our screens. This means we can play a real dealer and watch via webcam as they deal our hand and determine the outcome. Verse the dealer in live dealer Casino Hold’em at Royal Vegas Casino. Head to one of the suggested online casinos above and log into your account – registering takes just a few minutes if you haven’t already. Make a deposit if your balance is zero as you will need cash to play. Head the the ‘Live Casino’ category and locate the Live Casino Hold’em table. Once you have opened the title and it has loaded you can get started. 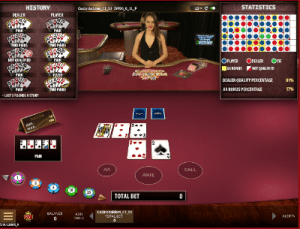 In live Hold’em, play begins with the player placing an ‘ante’ bet, a minimum of $0.50 to a maximum of $1000.00 per hand is available, which you can do via the digital interface – similar to RNG games. The dealer will then deal two face-up cards to the player and then their own two face-down, followed by the ‘flop’ (three face-up community cards). The player now has the option to either fold or call. Folding will forfeit the ‘ante’ wager, while a call to see the next two cards must be equal to at least two times the ‘ante’ wager. These actions are all easily made via the buttons below the video feed. The next two cards (the ‘turn’ and the ‘river’) are dealt face up together, the dealer then reveals their two cards, and the player and the dealer’s hands are compared according to traditional poker hands and their rankings (best five-card hand). The dealer must have a pair of fours or better in order to qualify for a hand comparison. If the dealer does not qualify, players who have seen the game through (placed the ‘call’ bet) win their ‘ante’ bet according to the ‘ante’ pay scale provided within the game. Their call wagers are pushed (no win, no loss). If the dealer qualifies and beats the player, both ‘ante’ and ‘call’ bets are lost. If the dealer qualifies and the player wins the showdown, the ‘ante’ is paid out according to the pay scale, and the ‘call’ wager is paid out at 1:1. If hands tie, ‘ante’ and ‘call’ stakes are pushed. Players can opt for an optional ‘bonus’ side bet prior to being dealt cards, with a minimum of $0.50 and a maximum of $500 available. This bet is based on whether the player is dealt a pair of Aces or something better off the flop (the first three cards), and successful hands are paid out according to the pay scale shown (if the player calls – you’d be ill-advised not to). Camera views will effect your live dealer Casino Hold’em experience. Within the live interface, we can chat with the dealer, choose between classic view (croupier and table viewed within a smaller screen within the betting interface) and 3D view (croupier and table occupying the entire screen, giving a true feeling of being at the live table). Change between the views while you are playing to find the best suited camera angle for you. We can also change the quality of the video feed from low, medium to high in order to suit your Internet connection. If you’re running out for the month you can even hide the camera feed and opt for the sounds and gameplay instead. We can view the game in full screen mode, check the gameplay history and our previous bets, and bring up the help tab for all the rules and player options.